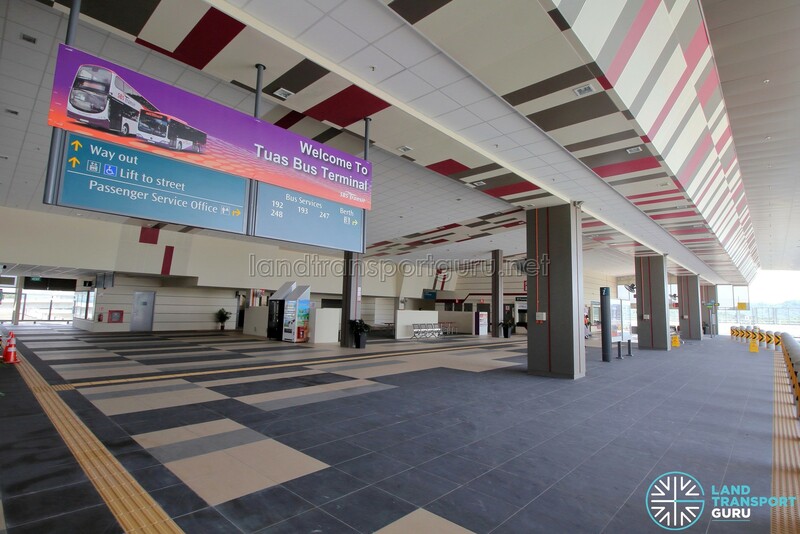 Tuas Bus Terminal is a bus terminal located in Tuas, next to Tuas West Drive and on the roof of Tuas MRT Depot. 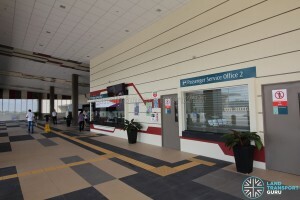 The westernmost bus terminal in Singapore is a terminating point for bus routes originating and terminating in the Tuas Industrial Estate, and serves Raffles Marina, Tuas Checkpoint, Tuas West MRT Depot and various industries in the area. 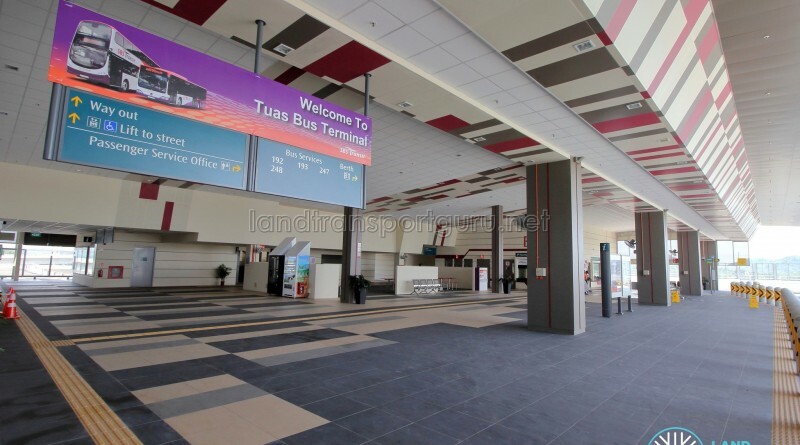 Currently, SBS Transit is the anchor operator of Tuas Bus Terminal. 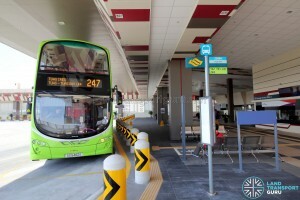 With the rollout of the Bus Contracting Model (BCM), the future operator of the Jurong West Bus Package will take over as anchor operator of this terminal. 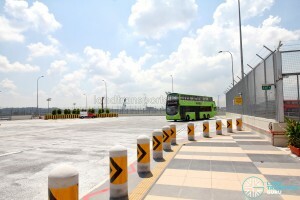 A single vehicular access ramp leads up to Tuas Bus Terminal from Tuas West Drive. 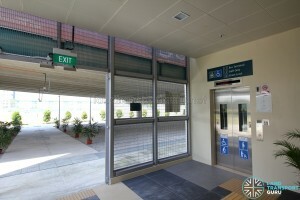 Pedestrian access is also from Tuas West Drive, where commuters can take a lift up three floors to reach the bus terminal. 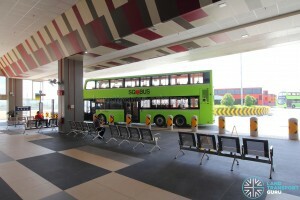 Tuas Bus Terminal is an elevated bus terminal located in the Tuas Industrial Area, just off Tuas West Drive and opposite Raffles Marina. The terminal primarily serves as a terminating point for bus routes serving the Tuas Industrial Estate. 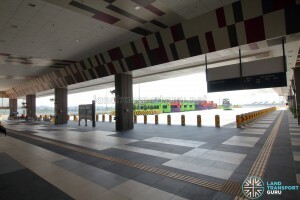 It connects with Tuas Link MRT Station along the East West MRT Line, allowing for convenient transfers between the rail network and bus services at the terminal. 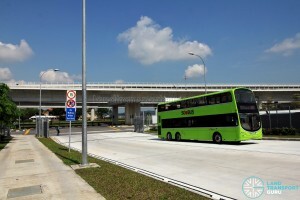 The elevated design of Tuas Bus Terminal makes it the first of its kind in Singapore. 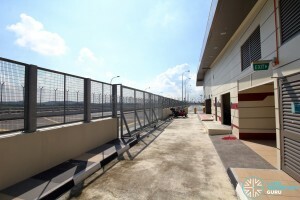 Located on the roof slab of Tuas MRT Depot and the equivalent of over three storeys above ground level, the terminal is approximately 10,000 sq metres and accessed by a long vehicular ramp from Tuas West Drive. 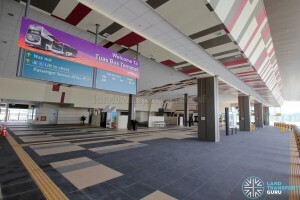 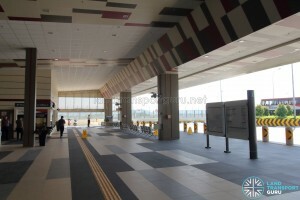 Pedestrians can access the terminal via a lift and staircase connecting the terminal and ground level, with an intermediate service floor for access into Tuas MRT Depot, which is out of bounds to unauthorized personnel. 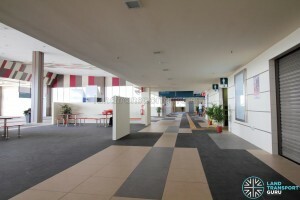 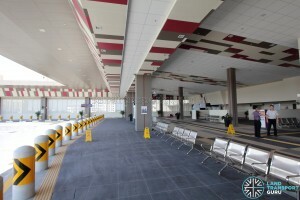 The bus terminal has a naturally ventilated Concourse Area with commuter facilities such as 2 separate Passenger Service Offices for Anchor and Secondary operators, an administrative office, staff lounges, canteen (closed), eating area, and other ancillary rooms. 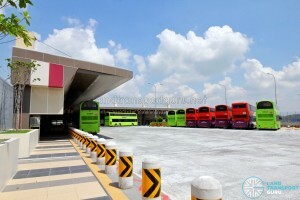 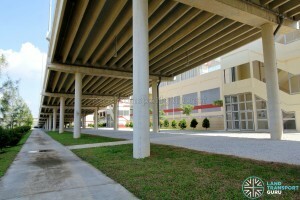 The bus park is located in the middle of the bus terminal. 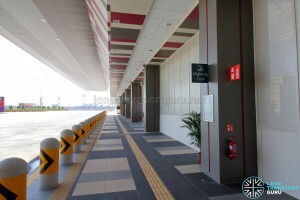 Similar to Shenton Way Bus Terminal, queue lines are not installed owing to the projected low passenger demand at the terminal. 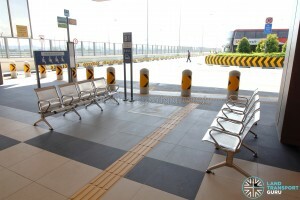 Instead, metal benches are installed for waiting commuters. 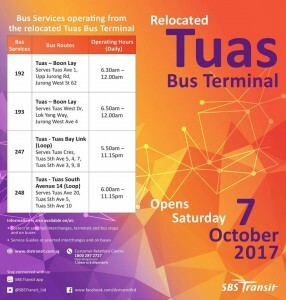 The new Tuas Bus Terminal opened on Saturday, 07 October 2017. 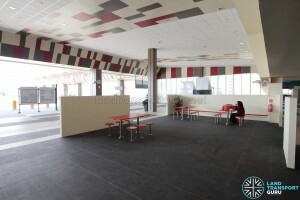 Owing to low footfall, the canteen is unoccupied and substituted with a vending machine for food and drinks. 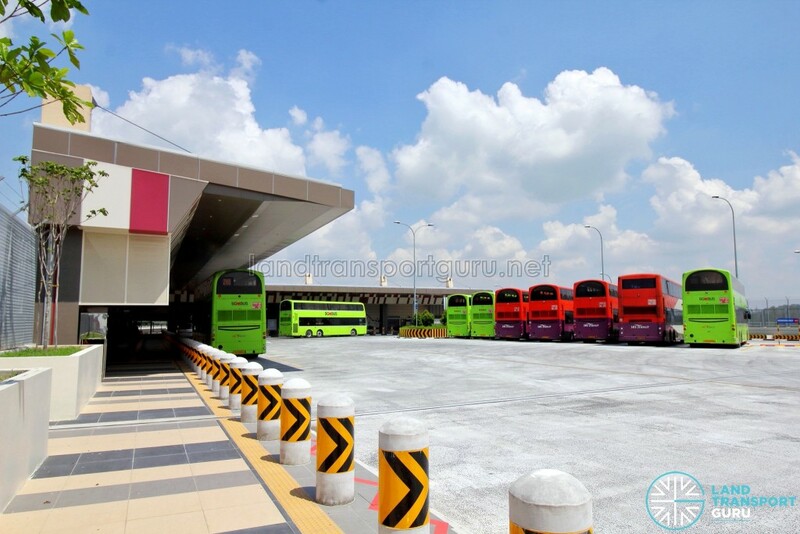 Bus drivers also receive packed meals for their meal breaks. 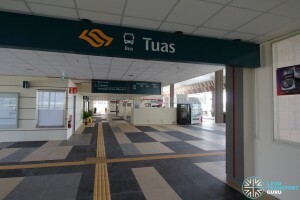 The original Tuas Bus Terminal was opened on 2 January 1998 to support the expansion of the industrial areas at Tuas and Tuas South. 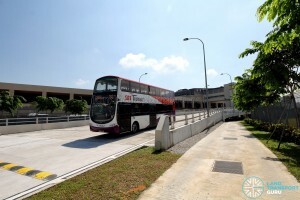 It served as a terminating point for bus services extending far into Tuas, with Service 192 and 193 extended to terminate there on the launch day. 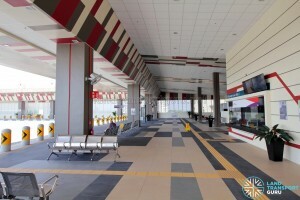 At its peak, the terminal served just four bus services owing to its remote location. 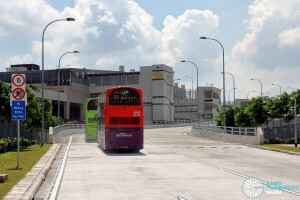 Services 182 (to Jurong East, later shortened to Boon Lay) and 183 (looping at Tuas South) operated out of Tuas Bus Terminal between July 1998 and May 2002 until they were merged into Service 182 between Boon Lay and Tuas South Ave 9 (Loop), bypassing the terminal. 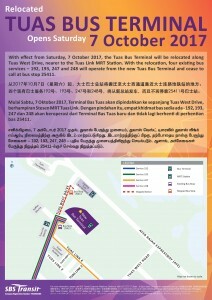 On 7 October 2017, the terminal was relocated to a new facility built on the roof of Tuas MRT Depot, near the junction of Tuas West Drive and Tuas Link 4, and right beside the Tuas Link MRT Station of the East-West Line extension. 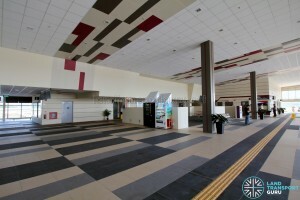 The old terminal was subsequently demolished.